In metallic or semiconducting ferromagnetic materials, different approaches for a non-inductive manipulation of the magnetization have been developed, taking in particular advantage of the coupling with acoustic waves. Their wave-like nature and their weak attenuation pave the way for interesting applications in magnonics. We have been focusing in particular on the study of dilute magnetic semiconductors (epitaxied at the C2N by A. Lemaître), materials that are key to the endeavors of spintronics to combine logic and storage functionnalities in a single componant. [click to enlarge] : (a) All electrical approach [JAP17]. (b) X-ray diffraction approach. The acoustic wave induces the appearance of satellite diffraction peaks whose amplitude increases with the excitation power. Once correctly modeled, it yields the amplitude of the surface displacement. [JAC16] (c) A perfect agreement is obtained between the two techniques. all-optical (picosecond acoustics,collab. B. Perrin, E. Peronne) : evidence of acousto-magneto-optical effects induced by a picosecond acoustic strain wave in thin layers of GaMnAsP [PRB10], which led to part of a sub-study on acoustic soliton characterization [PRB17-soliton]. The idea is to manipulate magnetization on time scales much shorter than those allowed by magnetic fields, and a lot more locally. For this we use a « pump-probe », time-resolved Kerr experiment relying on a femto-second laser. This allows us to follow the magnetization dynamics over a few ns after the pump pulse has triggered the magnetization precession. When several spin-waves are excited, the spin stiffness constant may be extracted from the separation between frequencies [APL15]. [click to enlarge] : Typical dynamical signal obtained by time-resolved Kerr effect in GaMnAsP. 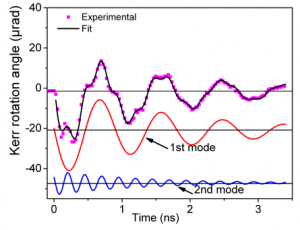 The experimental curve can be decomposed into 2 oscillating signals of different frequencies (T=12 K) [APL15]. The fundamental mode has a uniform amplitude across the layer thickness. That of the first excited mode is sinusoidal, and averages out to zero. It should therefore not give any magneto-optical signal. We have evidence that it is the optical phase shift felt by the light in the layer that allows it to be observed in the end. A consequence of this is the surprising experimental observation that the two modes seem to be counter-rotating [PRB17-sw]. [click to enlarge] : (a) Different modes that can be excited. (b) Dynamical reconstruction of the spin waves trajectory. A magneto-optical illusion is responsable for the apparent rotation sense. Studying linear magnetic dichroism hysteresis cycles versus temperature and pump fluence yields a quantitative determination of the stationnary temperature increase, and of its spatial gradient [JAP16]. [click to enlarge] : (a) Radial profile of the temperature rise induced by the pump (fluence 17.5 µJ/cm²) : data (symbols) and model taking into account a thermal contact resistance (full line) . (b) Analytical calculation of the radial and depth thermal profile [JAP16]. Current-driven domain wall motion is investigated experimentally in in-plane magnetized GaMnAs tracks. The wall dynamics is found to differ in two important ways with respect to perpendicularly magnetized GaMnAs or GaMnAsP : the wall mobilities are up to ten times higher and the walls move in the same direction as the hole current. We demonstrate that these observations cannot be explained by spin orbit field torques (Rashba and Dresselhaus types) but are consistent with non-adiabatic spin transfer torque driven by the strong spin-orbit coupling of GaMnAs. This mechanism opens the way to domain wall motion driven by intrinsic (bulk) rather than interface spin-orbit interaction as in ultrathin ferromagnet/heavy metal multilayers [PRB17-dwp]. [click to enlarge] : (a) Two track configurations : current flowing parallel (perpendicular) to the easy axis. The resulting effective spin-orbit field (hollow arrow) then lies perpendicular (parallel) to the magnetization direction. (b) Current-driven domain-wall velocity : 2µm wide C// track, under field (open symbols) and 10µm wide C┴ track without field (closed symbols). 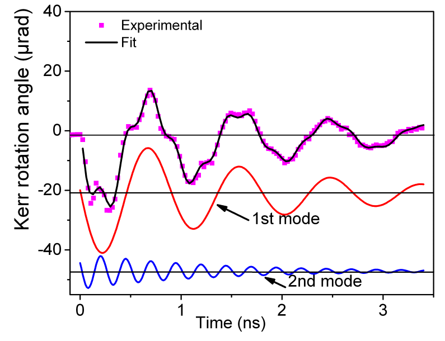 (c) Three consecutive current pulses applied to a 2µm wide C// track observed under longitudinal Kerr microscopy (B=11 G, T=40K, J=24.5 GA/m²) [PRB17-dwp]. [PRB09] Unusual domain-wall motion in ferromagnetic semiconductor films with tetragonal anisotropy, C. Gourdon, V. Jeudy, A. Cēbers, A. Dourlat, Kh. Khazen, and A. Lemaître, Phys. Rev. B 80, 161202(R) (2009). [PRB08] Field-Driven Domain Wall Dynamics in GaMnAs Films with Perpendicular Anisotropy, A. Dourlat, V. Jeudy, A. Lemaître, and C. Gourdon, Phys. Rev. B 78, 161303(R) (2008). [Lemaître08] Strain control of the magnetic anisotropy in (Ga,M n) (As,P) ferromagnetic semiconductor layers, A. Lemaître, A. Miard, L. Travers, O. Mauguin, L. Largeau, C. Gourdon, V. Jeudy, M. Tran, and J.-M. George, Appl. Phys. Lett. 93, 021123 (2008). 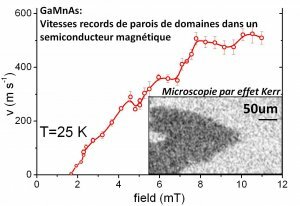 [Gourdon07] Determination of the micromagnetic parameters in GaMnAs using domain theory, C. Gourdon, A. Dourlat, V. Jeudy, K. Khazen, H. J. von Bardeleben, L. Thevenard, and A. Lemaître, Phys. Rev. B 76, 241301(R) (2007). [Dourlat07] Domain structure and magnetic anisotropy fluctuations in (Ga,Mn)As : Effect of annealing, A. Dourlat, V. Jeudy, C. Testelin, F. Bernardot, K. Khazen, C. Gourdon, L. Thevenard, L. Largeau, O. Mauguin, and A. Lemaître, J. Appl. Phys. 102, 023913 (2007). [Dourlat07] Domain wall dynamics in annealed GaMnAs epilayers A. Dourlat, V. Jeudy, L. Thevenard, A. Lemaître, and C. Gourdon, J. Supercond. Nov. Magn. 20, 453 (2007). [Dourlat07] Expansion and collapse of domains with reverse magnetization in GaMnAs epilayers with perpendicular magnetic easy axis A. Dourlat, C. Gourdon, V. Jeudy, C. Testelin, K. Khazen, J.L. Cantin, H.J. von Bardeleben, L. Thevenard, A. Lemaitre, IEEE Trans. Magn. 43, 3022 (2007).